Blurring the lines of gender in fashion. After Louis Vuitton took a progressive leap by having a male figure be one of the faces for their new women’s wear line, Jaden Smith has been challenging gender norms in fashion. Smith, alongside three female models, boldly questioned the lines of gender by wearing a skirt in a recent ad for the line. Spoken in true Smith style, the young star has a point. Clothing doesn’t have a gender attached to it. Photographed by Bruce Weber for the Louis Vuitton SS16 Ad Campaign. Your gender expression is distinct from your gender identity. Society’s preconceived notions of “femininity” and “masculinity” have set up imaginary boundaries on what is acceptable to wear. No matter what you identify as, how you choose to express yourself is up to you. Whether you’re a cis girl wearing a crisp menswear shirt or a cis boy wearing a little black dress, you have the right to wear that. 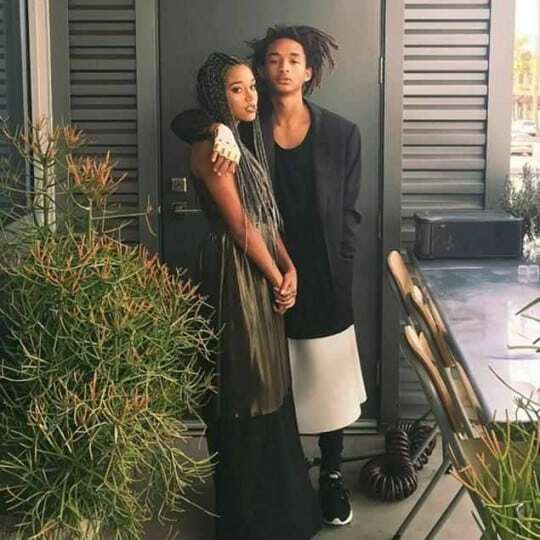 Jaden Smith and Amandla Stenberg. feminine clothing by the media and on his Instagram. Model and actress Ruby Rose, who identifies as gender fluid, believes Smith’s role in Louis Vuitton will have a positive impact. “It’s going to let people know they’re not different in a weird way; they’re different in a way that should be celebrated,” said Rose. Breaking the gender binary has become a prominent fashion movement in the past few years. Vetements’ fall 2016 line was one of many collections that blurred the lines of gender on the runway. Fashion retailer Zara recently released a gender neutral line titled “Ungendered.” Though people have called it problematic for releasing boring clothing that was already genderless, fashion designers are beginning to focus on tearing down the walls of gender. The conversation about gender has become a focus in the media, and that’s partly through fashion. In the wake of “Call me Caitlyn,” Laverne Cox, and trans model Hari Nef are making strides in the fashion world; designers and people are beginning to notice how expansive the gender spectrum is. Just “girl” and “boy” no longer exist, and that this is being recognized is a wonderful achievement. Keep on smashing gender roles, Jaden.